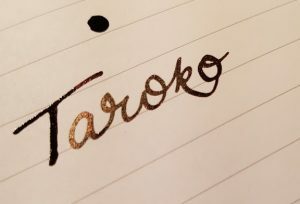 The Taroko A5 notebook is a great way to get a hold of some Tomoe River paper at a less-than-eye-watering price. For fountain pen enthusiasts, Tomoe River paper needs little introduction. It’s super lightweight but resists feathering and bleed-through like a much heavier paper. 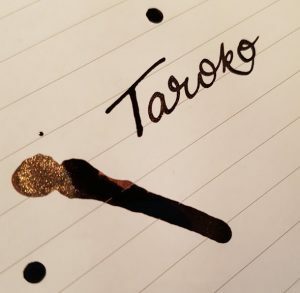 Through some paper alchemy, it’s also fantastic at showing off the sheen of inks. The Taroko Design notebook uses this legendary paper. Bureau Direct were kind enough to send some of us United Inkdom reviewers a sample notebook to take for a test drive. The one I’m reviewing here is the A5 size with lined paper. It’s also available in traveler’s notebook sizes, with plain and dot grid paper. The notebook is proper A5 proportions so will sit nicely with an A5 traveler’s notebook or alongside a Leuchtturm or other A5 notebook. It’s made with 62gms Tomoe River paper which is the slightly heavier of the two weights this paper is usually found in. The notebook isn’t much to look at from the outside. The lined version has a black cover (the dotted is brown and the plain blue). It’s a sugar (construction) paper cover which won’t take a lot of battering about. It’s clearly designed to be used with an additional cover. As it is, this won’t protect the insides from folding, tearing, spills or general bashing. It does keep the total weight and width down though. I’d never normally choose lined paper if dot grid or even plain was available. The lines are never the right width! The Taroko lines are a comfortable 7mm apart. Were I to buy one, I’d still choose dot grid, but I found the lined to be surprisingly pleasant. The real pleasure with Tomoe River paper is the writing experience. The paper is smooth and light. Fountain pen ink can take a little longer to dry on this paper so be prepared for that. But also be prepared to see your ink like you’ve never seen it before. I can also say, as someone who harbours the guilty pleasure of writing with ballpoint pen on sugar paper, this notebook would also be fun with ordinary pens. Herbin Caroube de Chypre- look at that shimmer! 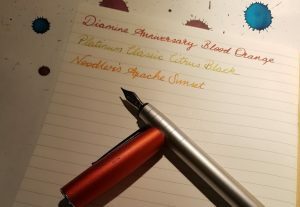 I dropped some ink on the notebook while writing this review, just to see how it handled it. 12 hours later (TWELVE HOURS) it’s still not quite dry. Of course, this isn’t the usual amount of ink a pen, even a wet pen, would put down. Left-handed writers might want to think twice about this paper. The tail of the drop is still wet 12 hours later! I really like this notebook but with some caveats. It is an absolute pleasure to write on. However, at £7.95 it’s a bit pricey. I suspect this would make me hesitant to use it and it might sit around for rather a long time while I waited for the perfect use for it. The soft cover also means that it would be better used inside an additional cover to protect it. 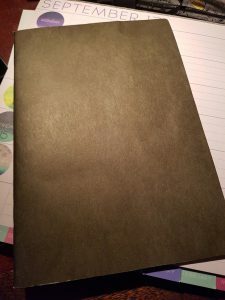 All that said, Tomoe River paper is unparalleled and this notebook is a great way to try it out without the exorbitant shipping costs that come with buying from abroad.